The Goff Financial Group is an independent investment management company based in Houston, Texas. Currently, we manage over $285 million in private accounts for long-term investors all over the country. Since 1994, we’ve grown steadily—not through acquisitions or mergers, but by providing prudently tailored wealth-management advice to meet the unique needs of our valued clients. 3. Tailoring investment solutions to suit your very unique financial goals and circumstances. 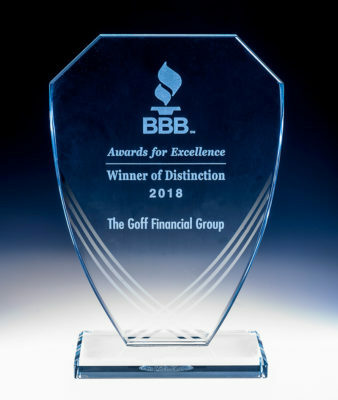 The Goff Financial Group was founded over 20 years ago with one idea in mind: provide long-term investors with sound, objective financial advice. We’ve never strayed from that proposition. To eliminate conflicts of interest, we are only paid by our clients; unlike most financial companies, we do not receive any commissions or fees from any financial products. We provide trusted advice. Period. Our valued clients have wholeheartedly embraced our approach. Our total assets under management* have grown steadily over the last 20 years to over $285 million today. To learn more about us, please contact one of our financial advisors at (713) 850-8900.